I found Bangkok to be a city of great contrasts. On the one hand there was the Chao Phraya river and all the historic sites along it, filled with treasures of amazing artistry and beauty; and on the other, there was the downtown area, which … wasn’t. The image above is an example of what I mean. 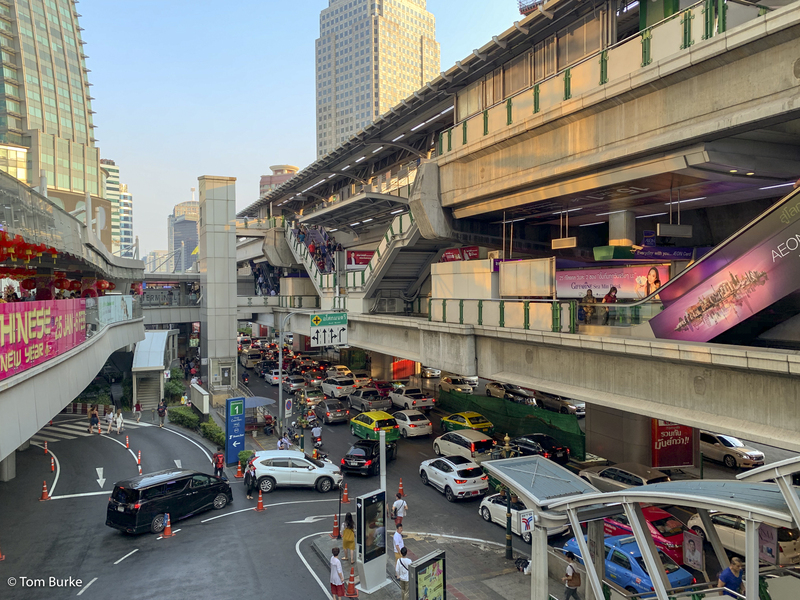 That’s Sukhumvit Road, a busy road in the downtown area. You can see three levels of development. At the bottom is the actual road, a wide dual carriageway packed with cars, four lanes on each side. At the top level (second floor) are the platforms of the SkyTrain station, with the escalators and stairs going up to it. (This is just an ordinary station, ‘Asok’, not the main station in the city centre.) Being a railway line, that second floor level just continues on for miles, of course. Then in the middle, at first floor level, there’s more stuff. In the middle of the picture is a plaza for the SkyTrain station – the ticket booth and machines, the ticket barriers, and the bottom of the steps and escalators up to the platforms, and also (not visible in this image) the top of the access steps and escalators from street level. One the left-hand side at 1st floor level is an access walkway to the ‘Terminal 21’ shopping mall – you can see the link from that straight into the SkyTrain station in the middle distance. And finally, what this image doesn’t really show is that this 1st floor structure continues under the SkyTrain level all the way to the next station, and onwards. Between the stations it’s an elevated pedestrian walkway, with regular access stairways down to street level – there’s an image below that shows this better. All that concrete, and all in 35° heat…. not much Thai grace or beauty on display here! Below are a few other spots that I just took quick snaps of. From the walkway at 1st floor level between two SkyTrain stations – railway line above, walkway at 1st floor level, road below.